The change of seasons is barely noticeable here in Santa Cruz. There is a drop of perhaps a few degrees of temperature between summer and fall but nothing else here tells me that fall is on the way. That isn’t happening today as we rapidly make our way up to 30 degrees centigrade. I remember when I was teaching English here, the text books would use the classic pictures to represent the four seasons….snow, sun and beach, falling leaves and spring flowers….somewhat like the motifs I used on my Four Seasons ticlla piece. They meant nothing to my students. They found it especially hard to grasp that fall would be the “opposite” season to spring in the northern hemisphere. I couldn’t blame them. As my departure date for my US trip draws nearer, I am wondering if anything in the northeast is telling people that spring is on the way. Please, say “yes”! My friend in Massachusetts told me to bring boots presumably for stomping about in snow. I don’t own a pair! So, I am just about ready to do some kind of dance in order to try and will that northern winter away and bring on the spring. Leaves could represent the new growth of spring or the dying leaves of fall…either way, a change of season. I suppose that blue leaves could be either! The leaves on my wall hanging, which were inspired by the chamantos woven in central Chile, are rather spring-like or even summery, I think. 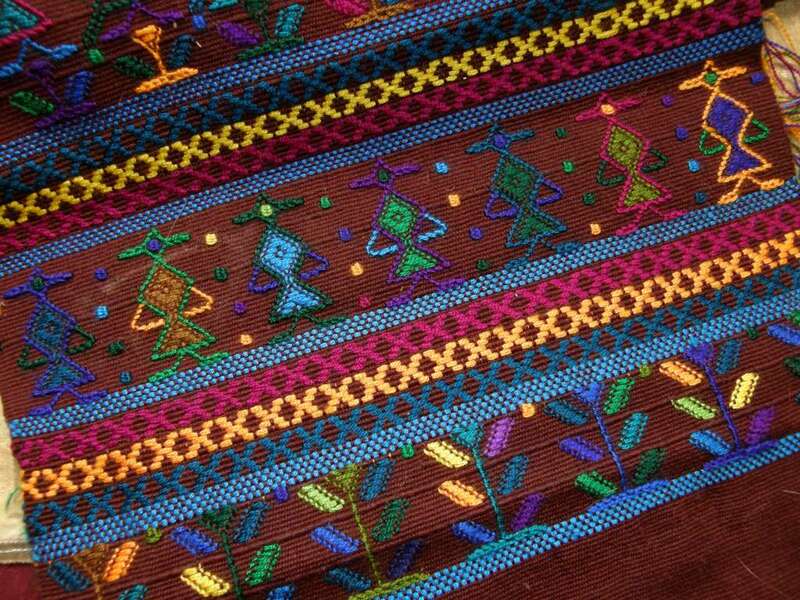 The motifs woven into the chamantos represent the agriculture and horse culture of that Chilean region. 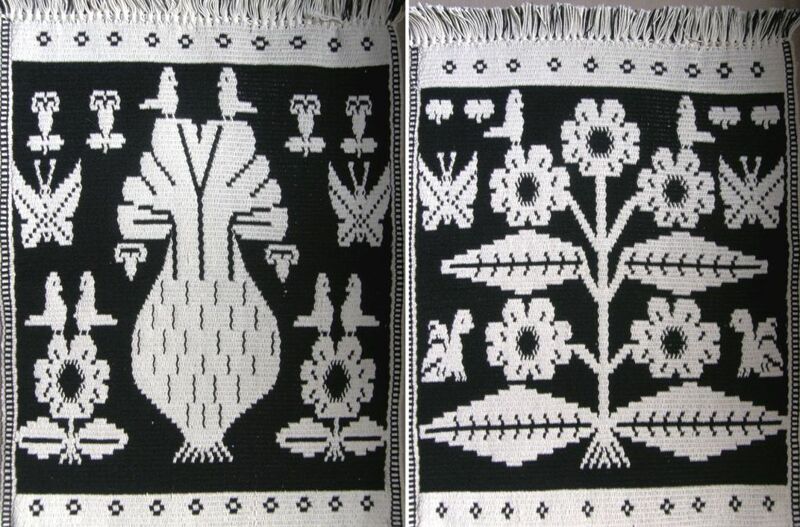 They are covered in patterns such as wheat stalks, flowers, horse hooves, grapes and vine leaves. 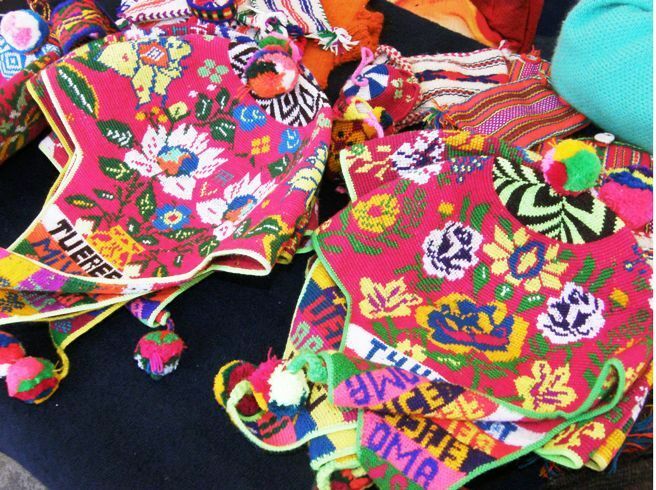 Crocheted hats and hat bands produced in the highlands, an area which can be quite colorless and bleak at times, provide a splash of colorful flowers and birds…. 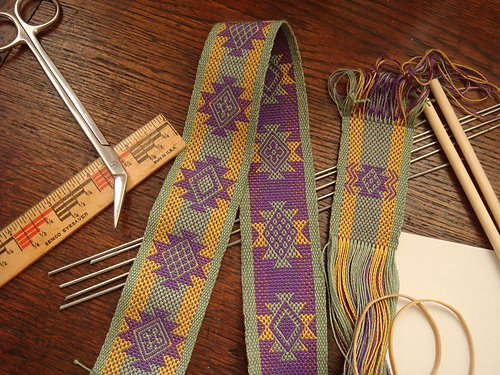 The above pieces were woven using what the Guaraní weaves call the moisy structure. They also use the kara pepo structure which we know as pebble weave. 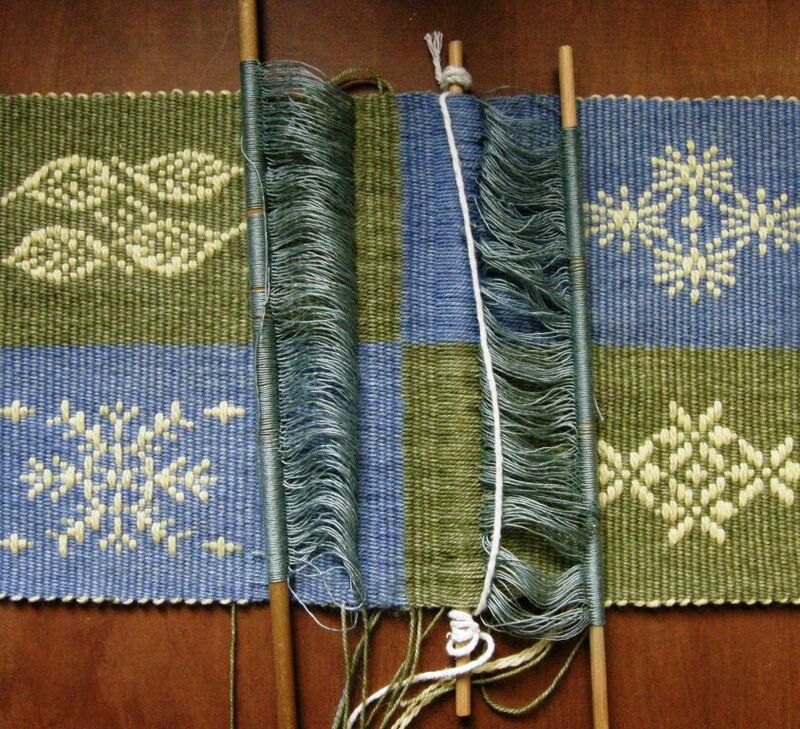 Julia, from the Ravelry group has been weaving a piece for her guild’s color challenge. 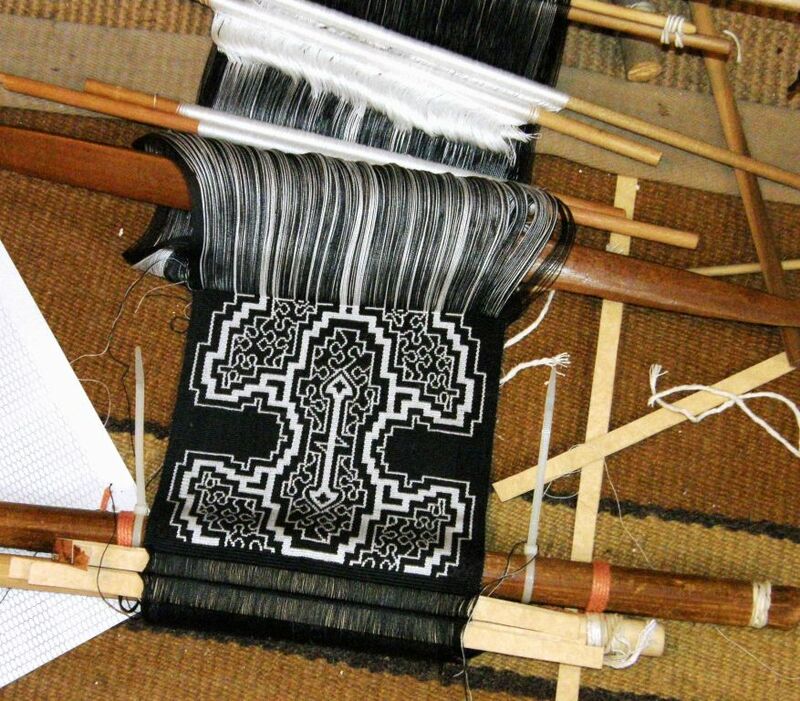 She is weaving Guaraní star motifs in pebble weave. It is always exciting or me to see people using the charts in my books. 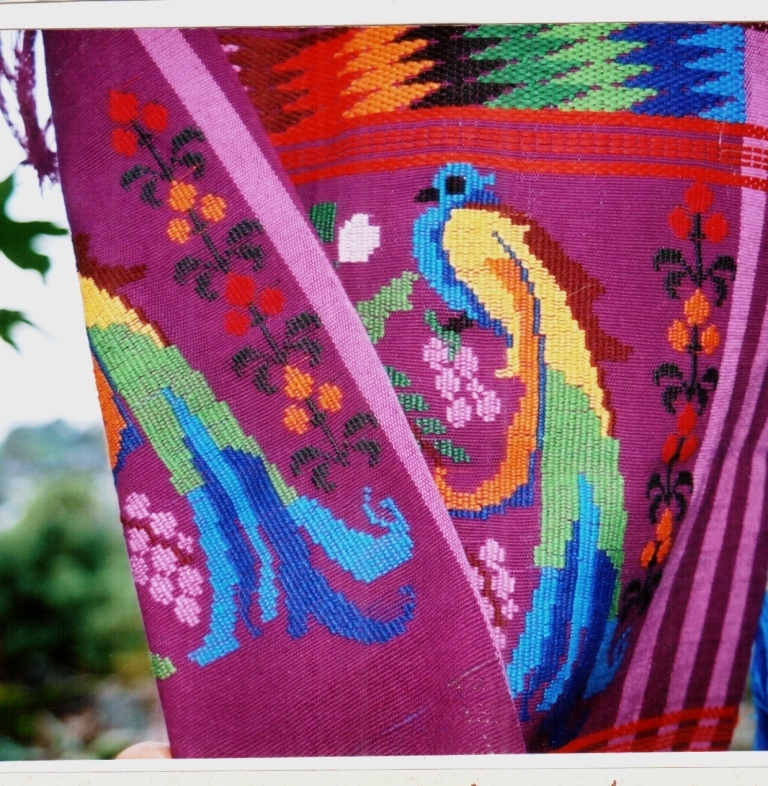 These star patterns are charted in my second book and the outline is a traditional Guarani pattern.. The basic star outline has its center filled with different shapes and it is an interesting exercise in designing to explore how many different kinds of “fillers” you can come up with for the space in the center of the stars. The Guaraní repertoire of star patterns is fairly small. While the patterns they weave using the moisy structure seem unlimited, the star is one of only very few motifs that they weave using the kara pepo structure. I came up with quite a few filler patterns for the star for my book and Julia, of course, has been very creative in inventing some of her own. 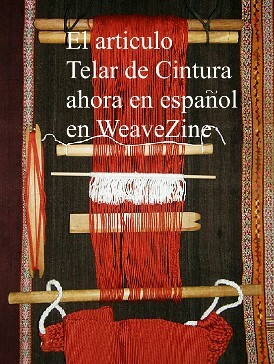 My Guaraní teacher, Angela, buys the same Brazilian Clea brand thread as I do for her weaving. It was shocking seeing how suddenly and how quickly the price of this cotton went up as it did all over the world and sad knowing how it would effect the weavers and their ability to buy thread. I am sure that they must be as happy as I am to find that cotton crochet thread is now being produced by TextiCruz here in Santa Cruz. While Santa Cruz used to be a major cotton producing region, cotton hasn’t been grown here for a long long time. I have no idea from where the raw material is coming. But, whatever the source, they are able to sell the finished product much more cheaply than the Brazilian thread! 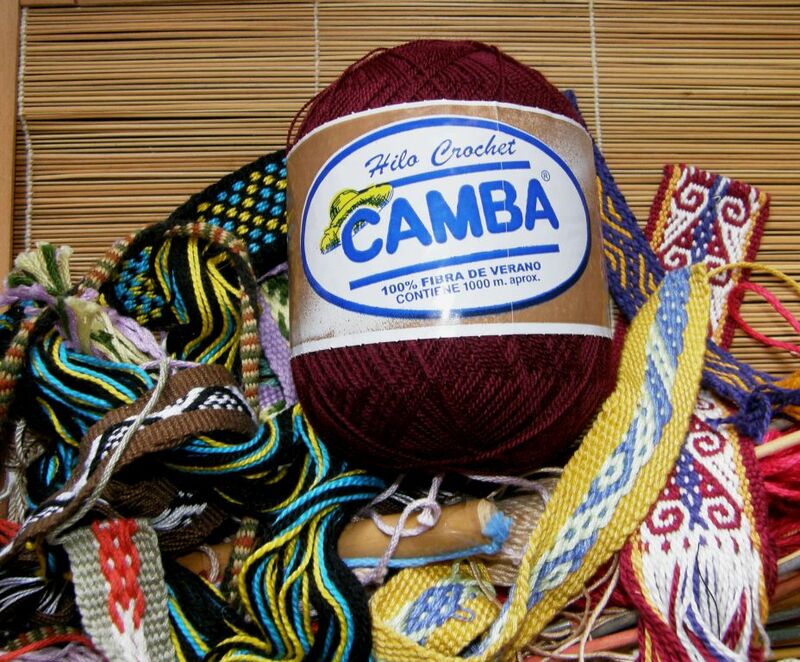 “Camba” is the nickname for people from Santa Cruz and the label shows the sombrero de sao, straw hat, which is part of the typical festival costume for this area. I bought one ball to try out. You can see it here among a chaos of sample bands that I am gathering for my trip. I am little suspicious about the color fastness. It sounds terrible but I have to say that things produced here tend to be of inferior quality. They are well presented but you only have to scratch the surface and…..It is wise to be suspicious of something that seems too good to be true. That goes for everywhere, right? I notice that the label has the typical words of advice on buying from one dye lot to complete a project, yet there is no dye lot number to be seen anywhere. Let me briefly slip back into the somber tones of winter as I would like to show you my progress on the squiggly Shipibo- inspired wall hanging panel. I would like to thank those who commented last week with words of encouragement. This week’s work on this included four hours of unweaving and re-weaving. I had forgotten to start one of the squiggles and I mistakenly thought that it wouldn’t matter so much. I was wrong. There was a large gaping hole of black space that I simply couldn’t live with. Four hours later I was back to where I had left off but much happier for it! rivers below looked very much like the squiggles I am weaving. I tried to guess which one of the squiggles might be the Amazon itself until I was completely blown away by the massive body of brown water that appeared and curved its way off to the horizon. 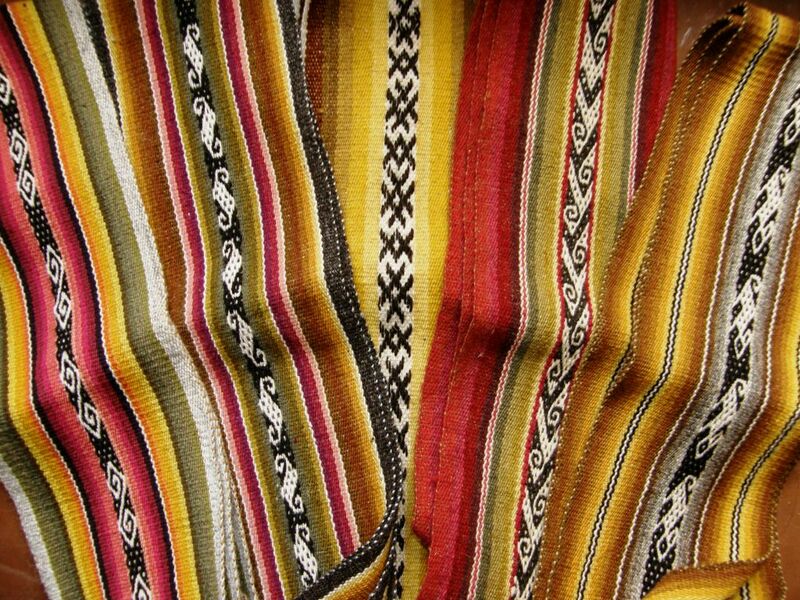 I have always been in complete awe of the weaving of the Jalq’a people of Potolo, Bolivia (at left). 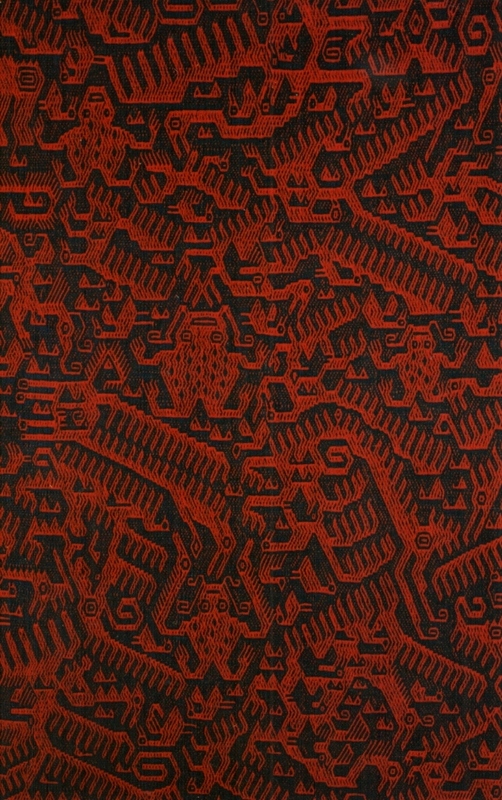 A complex mass of figures fills just about every space on the cloth. 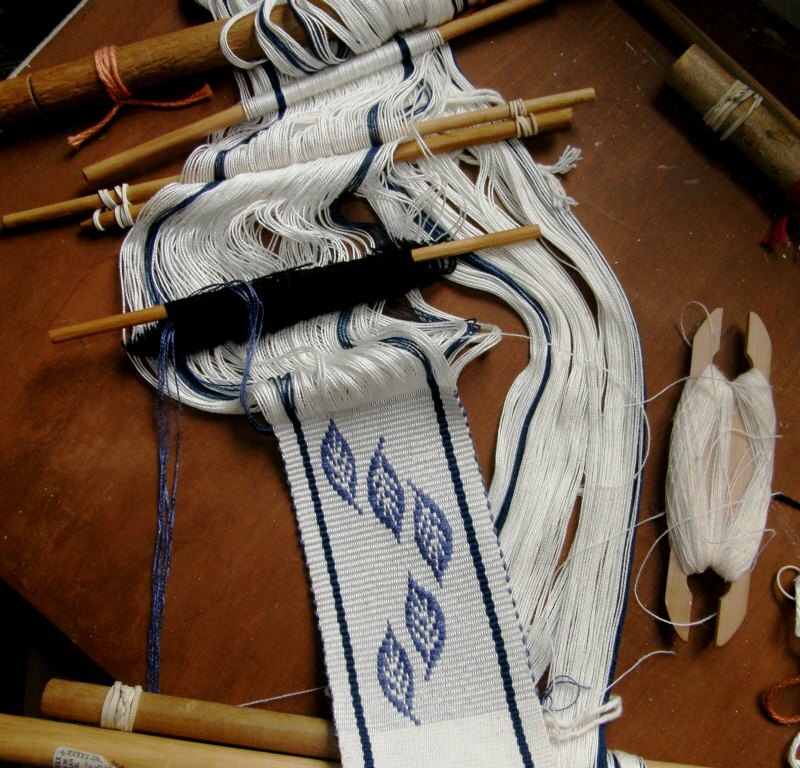 There is no break….no plain weave with which to relax between the concentration of pick-up patterning….a few rows to sit back and just open sheds, beat and pass weft…no, none of that. 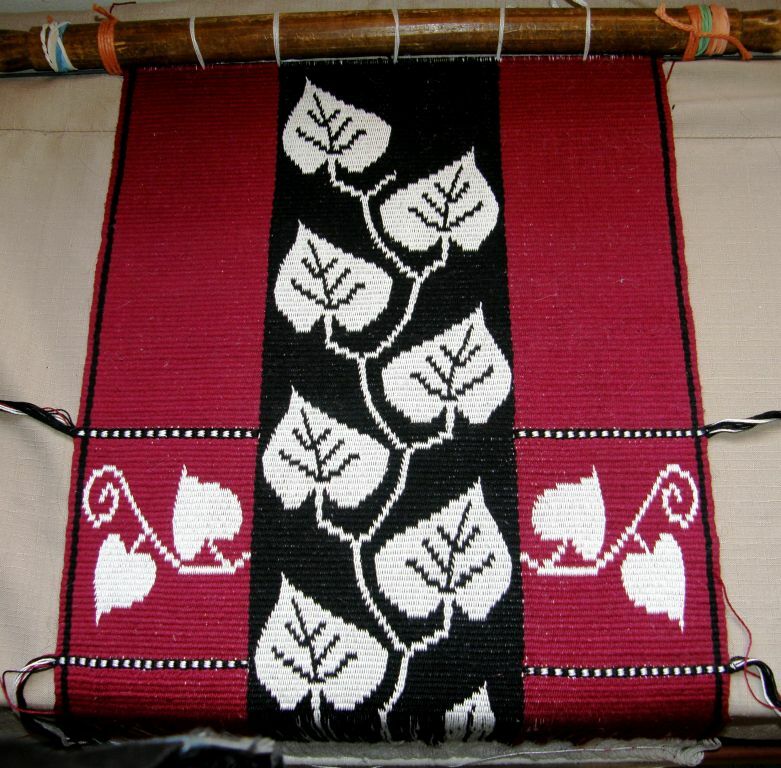 While halfway through one motif, the weaver is finishing another nearby and starting the next. 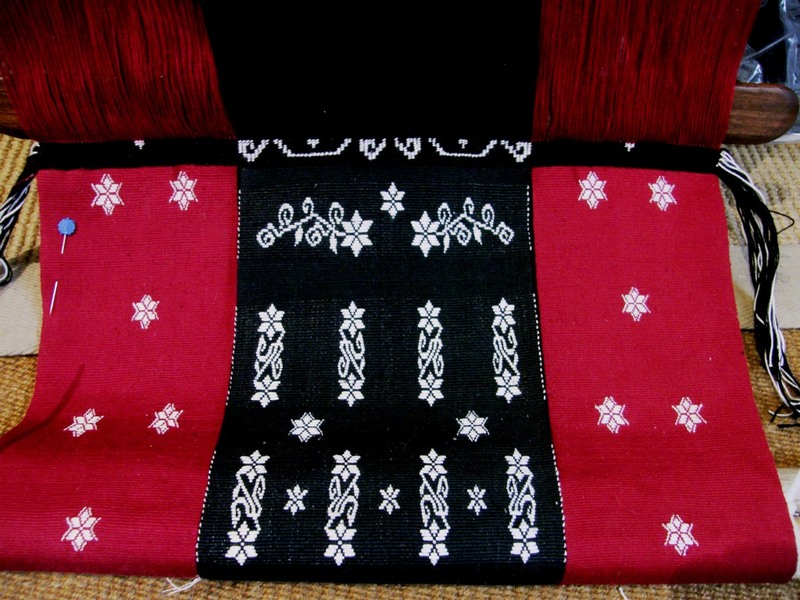 Small motifs are even woven within larger ones. Plus there are warp floats to consider. The weaver must ensure that she ties down each and every one of the threads at just the right moment before the floats become too long. And pattern charts, of course are not used. It’s mind boggling. 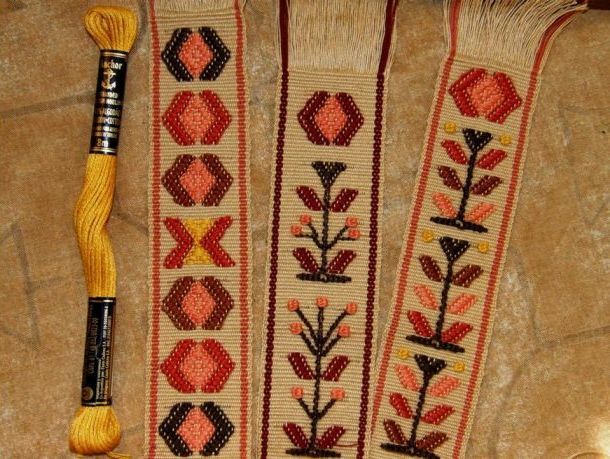 Although I am not weaving a warp-float structure and my patterning, therefore, is much easier, my current weaving with its squiggles starting and stopping and turning this way and that has given me an even greater appreciation of the work of the Jalq’a people. I have to remember to start the next squiggle while in the midst of one and finishing another. 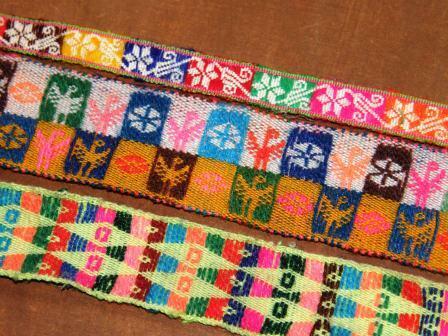 Here are some of the beautiful bands woven with naturally-dyed handspun yarn from PAZA in Cochabamba. Cochabamba city is one of many I have come across in my travels in South America that is named a city of “primavera eterna”…eternal spring. Please bring us spring! It has been a long, hard winter. Spring is very early in the Netherlands! Last year we had to waite so long for the spring flowers but this year our Narcissus is already blooming a month earlier the they use to. We had practicly no wintercold, no ice no snow. Thank you Laverne for your weekly blog, I enjoy it so much! I hope you will enjoy spring in the U.S.